One of the primary challenges of designing for mobile devices is that screen real estate is often in limited supply. Through the advocacy of Luke W and others, we’ve drawn comfort from the idea that this constraint ends up benefiting users and designers alike, from obvious advantages like portability and reach, to influencing our content strategy decisions through focus and restraint. But that doesn’t mean we shouldn’t take advantage of every last pixel of that screen we can snag! As anyone who has designed a website for use on a smartphone can attest, there’s an awful lot of space on mobile screens dedicated to browser functions that would be better off toggled out of view. Unfortunately, the visibility of some of these elements is beyond our control, such as the buttons fixed to the bottom of the viewport in iOS’s Safari and the WebOS browser. However, in many devices, the address bar at the top can be manually hidden, and its absence frees up enough pixel room for a large, impactful heading, a critical piece of navigation, or even just a little more white space to air things out. 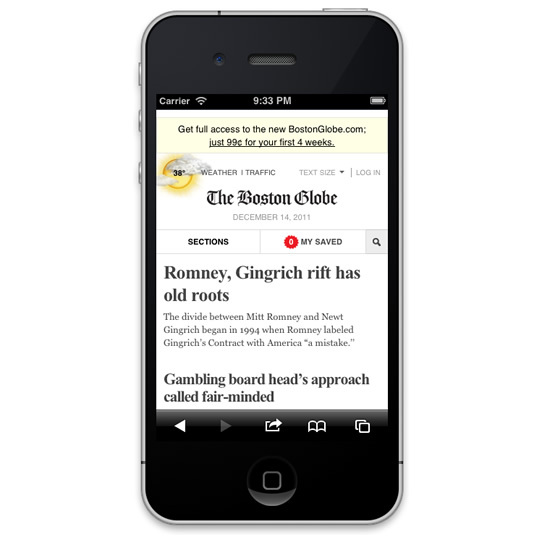 So, as my humble contribution to this most festive of web publications, today I’ll dig into the approach I used to hide the address bar in a browser-agnostic fashion for sites like BostonGlobe.com, and the jQuery Mobile framework. First, let’s assess the chromes of some popular, current mobile browsers. For example purposes, the following screen-captures feature the homepage of the Boston Globe site, without any address-bar-hiding logic in place. Note: these captures are just mockups – actual experience on these platforms may vary. 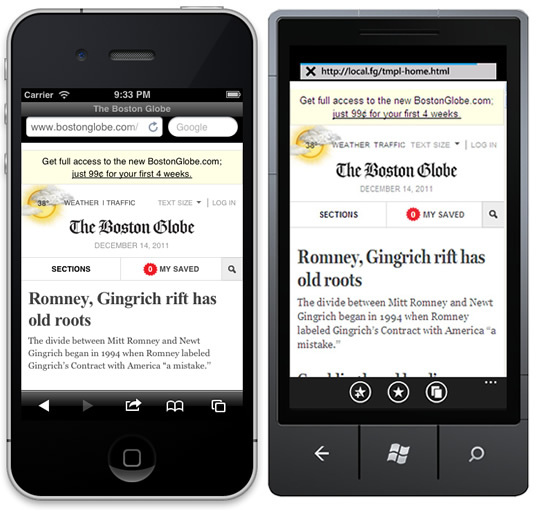 On the left is iOS5’s Safari (running on iPhone), and on the right is Windows Phone 7 (pre-Mango). 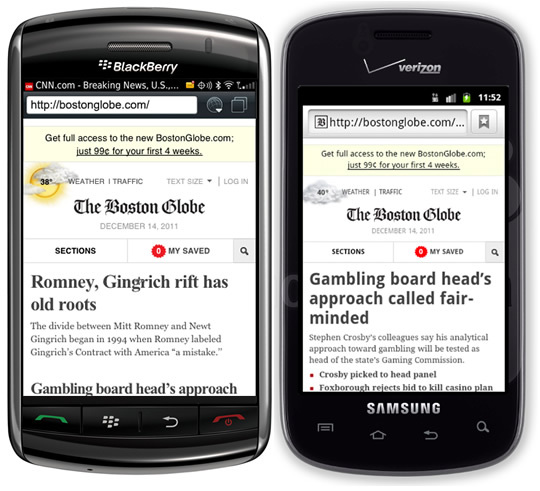 BlackBerry 7 (left), and Android 2.3 (right). 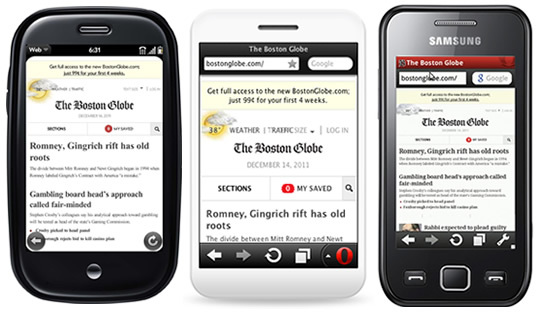 WebOS (left), Opera Mini (middle), and Opera Mobile (right). Some browsers, such the default browsers on WebOS and BlackBerry 5, hide the bar automatically without any developer intervention, but many of them don’t. Of these, we can only manually hide the address bar on iOS Safari and Android (according to Opera Web Opener, Mike Taylor, some discussion is underway for support in Opera Mini and Mobile as well, which would be great!). This is unfortunate, but iOS and Android are incredibly popular, so let’s direct our focus there. Great API, or greatest API? The scrollTo method is not new, it’s just this particular use of it that is. For the uninitiated, scrollTo is designed to scroll a document to a particular set of coordinates, assuming the document is large enough to scroll to that spot. The method accepts two arguments: a left coordinate; and a top coordinate. It’s both simple and supported well pretty much everywhere. In iOS and Android, these coordinates are calculated from the top of the browser’s viewport, just below the address bar (interestingly, it seems that some platforms like BlackBerry 6 treat the top of the browser chrome as 0 instead, meaning the page content is closer to 20px from the top). Anyway, by passing the coordinates 0, 0 to the scrollTo method, the browser will jump to the top of the page and pull the address bar out of view! Of course, if a quick call to scrollTo was all we need to do to hide the address bar in iOS and Android, this article would be pretty short, and nothing new. Unfortunately, the first issue we need to deal with is that this method alone will not usually do the trick: it must be called after the page has finished loading. The browser gives us a load event for just that purpose, so we’ll wrap our scrollTo method in it and continue on our merry way! We’ll use the standard, addEventListener method to bind the the load event, passing arguments for event name load, and a callback function to execute when the event is triggered. Now we’re getting somewhere, but we must also call the method after the load event’s default behavior has been applied. For this, we can use the setTimeout method, delaying its execution to after the load event has run its course. Sweet sugar of Christmas! Hit this demo in iOS and watch that address bar drift up and away! We’ve got a little problem: the approach above does work in iOS but, in some cases, it works a little too well. In the process of applying this behavior, we’ve broken one of the primary tenets of responsible web development: don’t break the browser’s default behaviour. This usability rule of thumb is often violated by developers with even the best of intentions, from breaking the browser’s back button through unrecorded Ajax page refreshes, to fancy momentum touch scrolling scripts that can wreak havoc in all but the most sophisticated of devices. In this case, we’ve prevented the browser’s native support of deep-linking to sections of a page (a hash identifier in the URL matching a page element’s id attribute, for example, http://example.com#contact) from working properly, because our script always scrolls to the top. Still works great! And a quick test using a hash-based URL confirms that our script will not execute when a deep anchor is in play. Now iOS is looking sharp, and we’ve added our feature defensively to avoid conflicts. Wait. You didn’t expect that we could write code for one browser and be finished, right? Of course you didn’t. I mentioned earlier that Android uses the same method for getting rid of the scrollbar, but I left out the fact that the arguments it prefers vary slightly, but significantly, from iOS. Bah! Differering from the earlier logic from iOS, to remove the address bar on Android’s default browser, you need to pass a Y coordinate of 1 instead of 0. Aside from being just plain odd, this is particularly unfortunate because to any other browser on the planet, 1px is a very real, however small, distance from the top of the page! At this point, some developers might decide to simply not support this feature in Android, and more determined devs might decide that a quick check of the User Agent string would be a reliable way to determine the browser and tweak the scroll value accordingly. Neither of those decisions would be tragic, but in the spirit of cross-browser and future-friendly development, I’ll propose an alternative. By this point, it should be clear that neither of the implementations above offer a particularly intuitive way to hide an address bar. As such, one might be skeptical that these approaches will stick around very long in their present state in either browser. Perhaps at some point, Android will decide to use 0 like iOS, making our lives a little easier, or maybe some new browser will decide to model their address bar hiding method after one of these implementations. In any case, detecting the User Agent only allows us to apply logic based on the known present, and in the world of mobile, let’s face it, the present is already the past. In this next step of today’s technique, we’ll apply some logic to quickly determine the behavior model of the browser we’re using, then capitalize on that model – without caring which browser it happens to come from – by applying the appropriate scroll distance. To do this, we’ll rely on a fortunate side effect of Android’s implementation, which is when you programatically scroll the page to 1 using scrollTo, Android will report that it’s still at 0 because oddly enough, it is! Of course, any other browser in this situation will report a scroll distance of 1. Thus, by scrolling the page to 1, then asking the browser its scroll distance, we can use this artifact of their wacky implementation to our advantage and scroll to the location that makes sense for the browser in play. To pull off our test, we’ll need to ask the browser for its current scroll distance. The methods for getting scroll distance are not entirely standardized across popular browsers, so we’ll need to use some cross-browser logic. The following scroll distance function is similar to what you’d find in a library like jQuery. It checks the few common ways of getting scroll distance before eventually falling back to 0 for safety’s sake (that said, I’m unaware of any browsers that won’t return a numeric value from one of the first three properties). In order to execute that code above, the body object (referenced here as document.body) will need to be defined already, or we’ll risk an error. To determine that it’s defined, we can run a quick timer to execute code as soon as that object is defined and ready for use. //more logic can go here!! With this working, we can immediately scroll to 1, then check the scroll distance when the body is defined. If the distance reports 1, we’re likely in a non-Android browser, so we’ll scroll back to 0 and clean up our mess. And with that, we’ve got a bunch more room to play with on both iOS and Android. …because we’re not done yet! In the spirit of making our script act more defensively, there’s still another use case to consider. It was essential that we used the window’s load event to trigger our scripting, but on pages with a lot of content, its use can come at a cost. Often, a user will begin interacting with a page, scrolling down as they read, before the load event has fired. In those situations, our script will jump the user back to the top of the page, resulting in a jarring experience. To prevent this problem from occurring, we’ll need to ensure that the page has not been scrolled beyond a certain amount. We can add a simple check using our getScrollTop function again, this time ensuring that its value is not greater than 20 pixels or so, accounting for a small tolerance. And with that, we’re pretty well protected! Here’s a final demo. The completed script can be found on Github (full source: https://gist.github.com/1183357 ). It’s MIT licensed. Feel free to use it anywhere or any way you’d like! I hope this article provides you with a browser-agnostic approach to hiding the address bar that you can use in your own projects today. Perhaps alternatively, the complications involved in this approach convinced you that doing this well is more trouble than it’s worth and, depending on the use case, that could be a fair decision. But at the very least, I hope this demonstrates that there’s a lot of work involved in pulling off this small task in only two major platforms, and that there’s a real need for standardization in this area. Feel free to leave a comment or criticism and I’ll do my best to answer in a timely fashion. At the time of writing, I was not able to test this method on the latest Android 4.0 (Ice Cream Sandwich) build. According to Sencha Touch’s browser scorecard, the browser in 4.0 may have a different way of managing the address bar, so I’ll post in the comments once I get a chance to dig into it further. 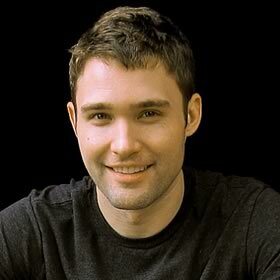 Scott Jehl is a web designer / developer who works with the bright folks at Filament Group. At Filament, Scott helps craft websites and applications for a range of clients, including the recent Responsive design of the Boston Globe, and regularly contributes ideas and code to the open source community, such as the recent Respond.js project. Scott enjoys writing and speaking about web design, and in 2010 co-authored the book Designing with Progressive Enhancement. He has written for A List Apart and is a jQuery core team member, most recently leading the development of the jQuery Mobile project. Currently, Scott is tromping around Southeast Asia with his wife, pushing his commits from afar.